Hochiki Europe, the leading manufacturer of life safety solutions, has launched FIREscape+ - an innovative system which combines emergency lighting, fire detection and wayfinding technology. Hochiki Europe, the leading manufacturer of life safety solutions, has launched FIREscape+ - an innovative system which combines emergency lighting, fire detection and wayfinding technology. The solution, which is the first of its kind, significantly enhances building occupant safety during an emergency, while simultaneously offering additional efficiencies for building owners. FIREscape+ features Hochiki Europe’s highly successful and cost effective FIREscape emergency lighting system, as well as its ESP intelligent range of fire detection products. By combining the two ranges and creating dual function exit signs, Hochiki Europe can now offer integrated life safety and innovative wayfinding technology in one system. In the event of a fire, dynamic emergency exit signs will illuminate with a red cross to prevent building occupants using an escape route compromised by fire. Meanwhile in unaffected areas, the exit signs will illuminate with the internationally recognised BS EN ISO 7010 green graphic, to safely guide building occupants to the closest available emergency exit. This ensures that building occupants are given the best possible opportunity to escape; even if they are unfamiliar with the building layout. The integration of Hochiki Europe’s Enhanced Systems Protocol (ESP) technology also offers a number of benefits when it comes to false alarm management. Every 24 hours, the system checks for any changes to the environment and recalibrates the sensors to suit. In addition, each sensor can be individually adjusted to match the expected risk of its environment, while alarm verification technology uses time delay algorithms to eliminate unwanted alarms. These features help ensure the life safety system operates at optimum performance at all times. 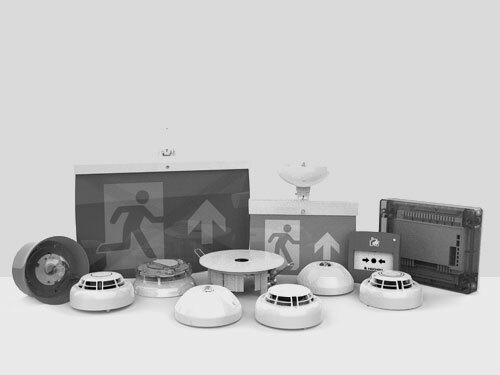 FIREscape+ is the only truly combined fire detection and emergency lighting solution currently available to the market. A single panel controlling both fire detection and emergency lighting units on a single loop, can cut costs by up to 40 per cent. Furthermore, the range operates at extra low voltage without the need for mains power, further reducing the cost of ownership. Ian Watts, Emergency Lighting Manager at Hochiki Europe noted: “We know that our customers, especially those working with large premises, want to be able to specify and install the most effective life safety solutions at an affordable cost. By integrating our fire detection and emergency lighting technology, we’re able to offer an innovative range that helps them do just that.